Diales is hosting a conference in conjunction with Paris Arbitration Week on 3rd April 2019. Come hear leading stakeholders in the world of arbitration in India provide their insights on “Arbitration in India in a global economy”. The conference will be followed by a live Q&A session and a breakfast. Galloping urbanisation and the need for infrastructure and transportation has made the construction market one of the main drivers of Indian GDP growth. Arbitration comes within a broader frame where attracting and promoting lasting foreign direct investment is key to supplement domestic companies. Can arbitration help build confidence for foreign companies willing to work in India? Is India’s reputation of being interventionist towards international arbitration grounded? Can arbitration awards be challenged? Do the changes outlined in the ongoing arbitration reforms go far enough? 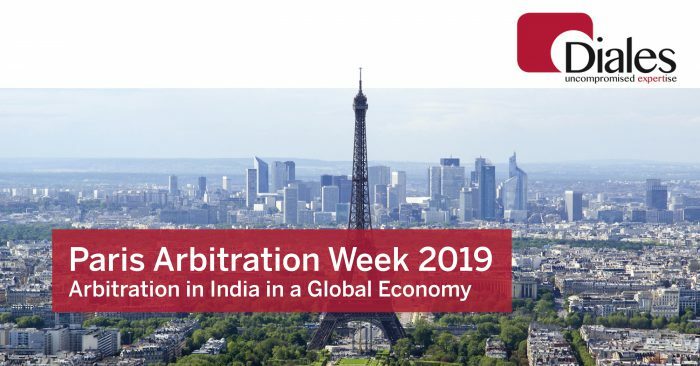 Leading stakeholders in the world of arbitration will provide their insights on India’s overall context supported by various examples of field experiences. Diales is delighted to be taking part in the 3rd Kuwait Project Management Conference 2019. 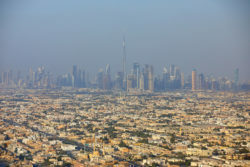 John Dowse, Diales Expert in the Middle East will be speaking about the need to adopt dispute resolution practices in a growing construction market place. Now in its third year, the Kuwait Project Management Conference is a great networking platform for project, program, and portfolio managers and practitioners in the region. Attendees will get an opportunity to listen to industry experts deliver valuable insights and actionable solutions to overcome emerging project management challenges. Keynote and invited local and regional expert speakers will present their professional expertise and experiences on the latest initiatives, techniques, innovation, excellence and leadership in the project management industry. John is a commercial and contracts specialist with over 35 years’ construction experience; including experience of many forms of contract worldwide. In this time, John has been a Party appointed expert in both Quantum and Delay matters. He has extensive experience in domestic and international arbitration including tribunal and panel experience in Arbitration and Dispute Adjudication and Resolution Boards. He is a registered Mediator, including appointment by the Court. 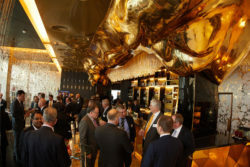 Attending the event will be Diales Quantum Experts, Lee Barry and Ken Clarke. Mark Wheeler, will be presenting a practical guide about Dealing with Conflicting Pressure, at the Expert Witness Conference Commercial, Property and professional negligence claims, in London on the 5th April 2019 at the Conference Central, Malet Street, London, WC1E 7HY. His topic “Dealing with conflicting pressures – a practical guide” is a session of practical guidance with reference to case law. It looks at how an expert witness must often deal with external pressures from other experts, instructing solicitors, counsel, and clients. There is a need to balance these pressures against an overriding need for independence and compliance with the duty to the court. For information about the other speakers at this event, or to book your place click here. Diales Technical are shortlisted for an award. Diales technical have been shortlisted for the Small Projects (of under £1 million) award at the IStructE Awards 2018 for their Jacob’s Ladder structure in New Zealand. 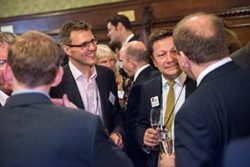 The Institution of Structural Engineers has been celebrating structural engineering excellence for over 50 years. The Structural Awards recognises the most talented structural designers and their indispensable contribution to the built environment, from large awe-inspiring landmark structures to small local projects. Winning an award is a symbol of excellence that is recognised around the world. To view the full shortlist or for more information please visit The Structural Awards website. Garth McComb, Quantum and Delay Expert for Diales and Malaysia Country Manager, will be on the panel discussing the evolving role of experts in international arbitration. The event will also be covering topics such as Regional Development in ADR, Third party funding in Asia and International Arbitration across Asia. 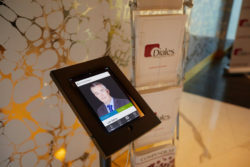 If you would like to arrange a meeting with Garth or any of the team please email marketing@diales.com. 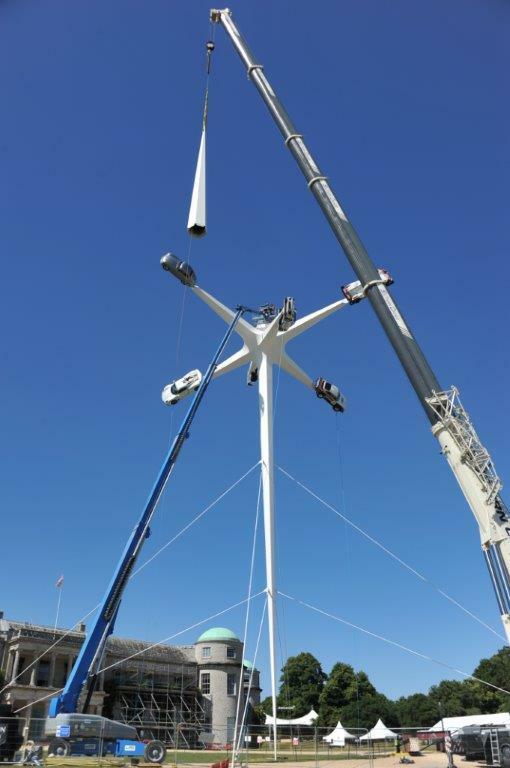 For twenty-two years, the artist Gerry Judah, recently aided by the Diales engineering team (Bruno Postle, Hooman Baghi and Stuart Holdsworth), has been commissioned to build a spectacular centrepiece sculpture for the Goodwood Festival of Speed. This year it is celebrating seventy years since the Porsche 356 was first introduced in 1948. With 2016’s BMW installation commended for ‘structural artistry’ at the Institute of Structural Engineers annual awards, the pressure was on to deliver something even more spectacular for 2018. Mission accomplished! A spike mace with long spar arms holding six real Porsche cars weighing in at approximately six tonnes and standing 52m high (the same as Nelson’s Column) – all supported on one slender leg (so fine at the bottom that you can put your hands around it), which is stabilised by anchored steel solid bars. The overall weight is 28 tonnes of perfectly laser cut, doubly curved thin steel plates monocoque. The images speak for themselves, but here’s a little more detail on six Porsche models featured this year. The 356 was the first Porsche produced in 1948, a priceless Coupé model has been lifted forty metres into the air and has been left hanging upside-down. The 917 is an endurance racer, as driven by Steve McQueen in the 1971 film ‘Le Mans’. The 959 Paris Dakar rally winner from 1987, a twin-turbo flat-six four-wheel drive. The 918 Spyder is a hybrid road car from 2015, a 608bhp V8 petrol engine with 286bhp from two electric motors. Another hybrid car is the 919 Le Mans Prototype from 2015, this car holds the Nürburgring Nordschleife lap record, previously unbroken since 1984. The 911R is a limited-edition road car introduced in 2016, representing the latest in Porsche design. Look closely and you can tell these cars are the real-deal from the visible corrosion and repair jobs they have taken over the years. The Diales engineering team will be back soon with more details of the challenges and technical know-how needed, along with Gerry’s vision, to keep on making a plethora of amazing vehicles fly! This highly anticipated conference will be held in Hong Kong, from 26-27 June 2018. If you would like more details about the conference please click here. Attending the event will be renowned Delay Expert, John Lancaster, from our Singapore office and Lorraine Gillespie an Associate Director for Driver Trett from our Hong Kong office. 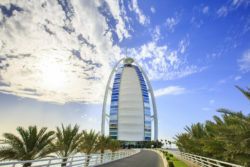 On 19th April, Diales hosted a reception at the stunning Burj Al Arab. 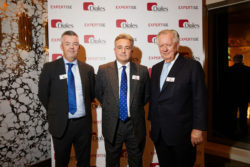 We were delighted to welcome so many clients and representatives from the global Diales Expert Witness team for a thoroughly enjoyable evening which included a welcome speech from Driver Group Chairman Steven Norris and incredible views from the 27th floor. Octavian Dan, Technical Director at our London office will be attending GAR Live Construction Disputes Conference on 12th April 2018, Paris France. This event will offer a unique opportunity to explore and discuss key themes with top practitioners and arbitrators from around the world. Paul Battrick, Quantum Expert of Diales will be attending the ICC Institute Advanced Training on “Drafting enforceable awards” taken place on 11th April. The training will focus on what can be referred to as the most prominent duty of an arbitrator and attendees will learn the best practices pertaining to drafting awards and the ways of maximising their enforceability. This interactive and practical training will focus on the procedural as well as formal requirements and cover the issue of the necessary substantive accuracy of the award. Should arbitration in investment protections treaties be forsaken? As part of Paris Arbitration Week, Diales are proud to be associated with and a sponsor of this year’s Paris Place d’Arbitrage annual colloquium ‘Should arbitration in investment protections treaties be forsaken?’. Paul Battrick, Quantum Expert and Frédéric Berjot, Quantum Expert will both in attendance at the event. On 23rd March 2018, Paul Battrick – Quantum Diales Expert, will attend this years’ DRBF Conference which will take place in Paris, France. The conference will focus on the application of Dispute Boards, first-hand experience with new developments across the world, and the unique preventive role that Dispute Boards offer. More information about the DBRF Conference can be found here. 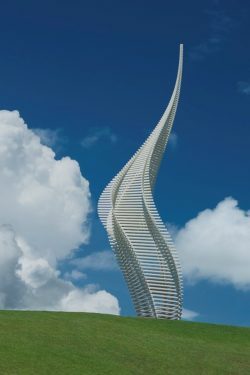 JACOB’S LADDER is a new sculpture designed by Gerry Judah and engineered by Diales for Gibbs Farm Sculpture Park, New Zealand. This is yet another collaboration between Diales and Gerry Judah after the success of both the BMW and the Bernie Ecclestone centrepieces for the 2016 and 2017 Goodwood Festival of Speed. The BMW sculpture earned Diales a commendation in the Structural Artistry category from the Institute of Structural Engineers at the 2017 IStructE Awards. Other works recently completed or under construction are a sculpture for Porsche cars at Ascot racecourse, a sculpture for a private collector in Mexico, and another spectacular installation currently in progress for the 2018 Goodwood Festival of Speed. The Diales team of Bruno Postle and Hooman Baghi, led by Stuart Macdougald-Denton and Stuart Holdsworth, are experts in the field of light-weight, slender and high-performance structures – along with the use of computerised design techniques and Building Information Modelling (BIM) for delivering high precision complex geometries. Gibbs Farm is a thousand-acre private sculpture park near Auckland on the North Island of New Zealand. The farm features over thirty monumental sculptures from a roll-call of top international contemporary artists including Richard Serra, Anish Kapoor and Andy Goldsworthy – a roll-call now graced with this elegant new piece commissioned from Gerry Judah. Alan Gibbs is a New Zealand businessman, entrepreneur and art collector who has been assembling the Gibbs Farm collection for twenty-six years. Gerry Judah is a British artist and sculptor who has exhibited in many locations including the Imperial War Museum and St Paul’s Cathedral. 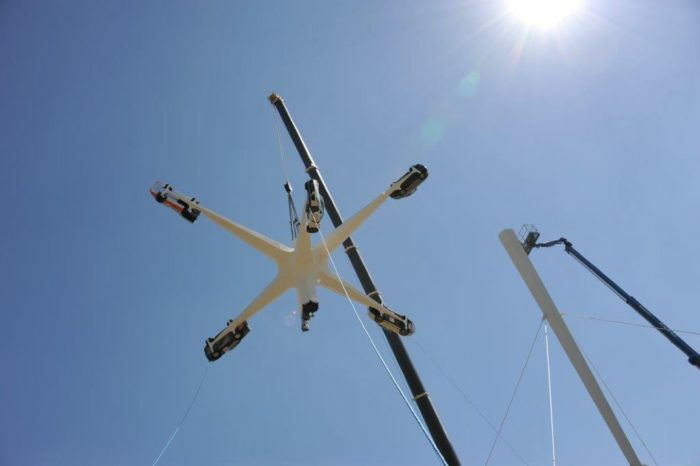 Gerry is also responsible for the last twenty-five years of increasingly spectacular centrepiece sculptures for the annual Goodwood Festival of Speed, latterly assisted by Diales. JACOB’S LADDER is 34 meters (112 feet) high and weighs 46 tonnes. Made from 480 lengths of steel, stacked one on top of each other, each slightly different in length and size, shifted and rotated relative to the layer below, ultimately producing the final gracefully curving shape – this despite the components themselves all being simple straight steel sections. To achieve this effect Diales created custom software that generated the smooth curved shape, and sliced this shape into layers of varying thickness, all in order to assemble both a structural analysis model and precise cutting and assembly instructions. The sculpture is on top of a hill in an extremely inaccessible location. The structure needed to account for both tropical cyclones and earthquakes, and was designed to British Standard, Eurocode and local Australian/New Zealand Code of Standards. This was a challenging project delivered on-time and on-budget to the highest levels of detail with an immaculate finish. Due to logistical and on-site constraints, the Diales team provided detailed design including splice-connections and welding to coordinate with the local contractor’s safe method of construction. Diales would like to congratulate Hooman Baghi, Associate Director, and Technical Directors, Tom Harrison and Simon Richards, who have all successfully obtained further professional recognition within the industry. Tom Harrison was awarded membership of the American Society of Civil Engineers (M.ASCE), Hooman Baghi was awarded membership of the Institution of Civil Engineers (CEng MICE) and Simon Richards is now a Senior Member of the American Institute of Chemical Engineering (SMAIChE) and a Member of the Institute of Engineering and Technology (MIET). Mark Stevenson is a Chartered Quantity Surveyor and a Chartered Civil Engineering Surveyor, based in Bristol, with over 30 years’ experience in the engineering and construction industry. Ben Chamberlain is a Chartered Architect, based in London, with over 25 years’ experience in private architectural practice in a wide range of building sectors. 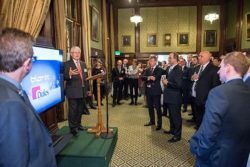 On 28th September 2017, Diales hosted a drinks reception at the Houses of Parliament, where an enjoyable evening was had by all who attended. Highlights of the evening included guided tours of the Houses of Parliament, and we were very privileged to have Sir Vivian Ramsey as our keynote speaker. Click here to view more images of the event. Diales Technical were awarded a commendation for the “BMW sculpture for the 2016 Goodwood Festival of Speed” in the Structural Artistry category at the 2017 Structural Awards on Friday 17th November 2017. 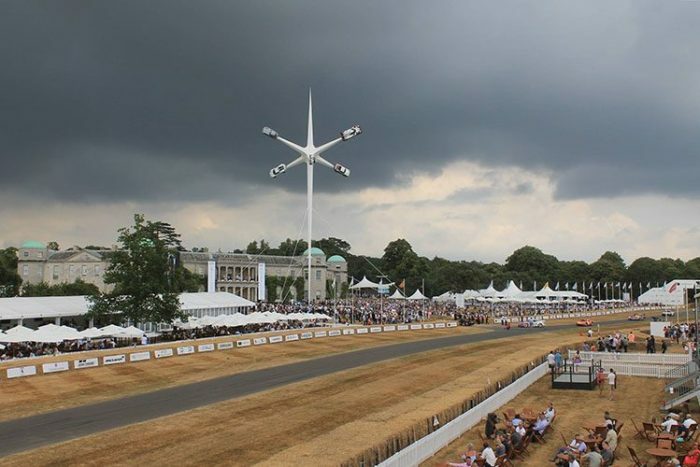 This was in recognition of their engineering support of the sculptor Gerry Judah, the creative genius behind the Goodwood Festival of Speed’s breath-taking, centerpiece sculptural creations. They’ve been working with Gerry on these projects for a number of years and always rise to the challenges that Gerry’s vision delivers. 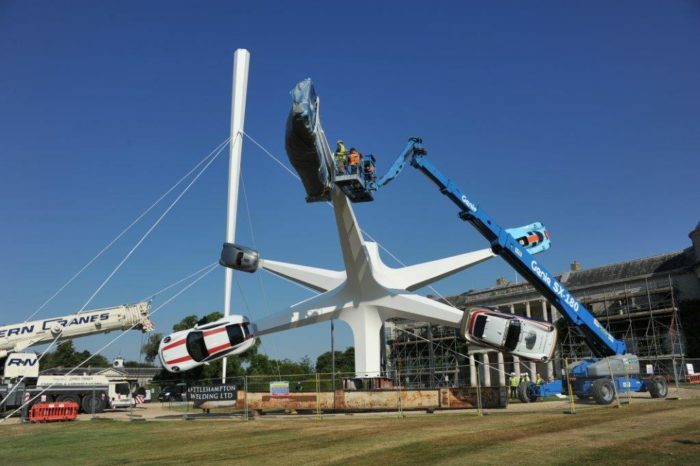 “The new sculpture for the Goodwood Festival of Speed comprises three curved triangular sections, each of which supports a car at their tip. The sections are constructed from rolled steel. The geometry has been conceived so that all of the section sides are developable surfaces that can be fabricated from flat sheets which are rolled into curves to achieve the final form. The steel sheets were laser cut and welded together into the triangular section which provides all of the required strength and stiffness for the structure. For more information or to see the list of categories and winners, click here. On 14th September 2017, Mark Castell – Delay and Quantum Diales Expert, will attend this years’ Dutch Arbitration Day which will take place in Amsterdam. This years’ event marks the fifth anniversary of the Dutch Arbitration Day and will focus on the latest developments in the areas of advocacy and evidence, bringing together international arbitration practitioners as well as academics and in-house counsel. Leaders in the field of international arbitration will share their views and provide practical insights. They will cover topics such as; effective oral advocacy, (cross-) examination of witnesses and experts, and preparation and presentation of written testimony and expert evidence. The conference will take place in an interactive setting and will provide an excellent environment for participants to tap into the experience of seasoned practitioners from various jurisdictions. Independence Day: Why Do Many Experts Fail at Being ‘Independent’? We are delighted that Paul Taplin, Head of Diales (Middle East), has had his article “Independence Day: Why Do Many Experts Fail at Being ‘Independent’?” published in Lawyer Monthly magazine, where he discusses the difficulties faced when choosing, and acting as, an Expert Witness. John Mullen, our Diales principal and one of our quantum experts, has been published in the 2017 Construction Law Review writing on the subject of the financial effects of delay. To read his article in the Construction Law Review click here. 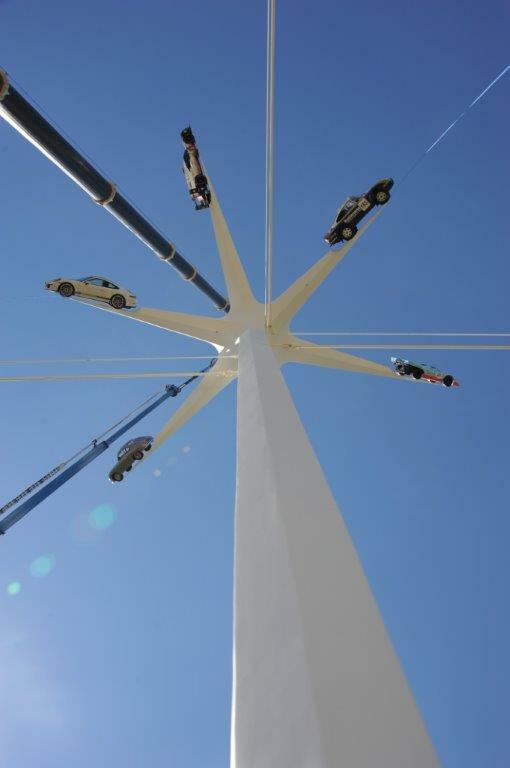 Diales technical have been shortlisted in the following categories; Small Projects (of under £1 million) and Structural Artistry at the Structural Awards 2017 for their BMW Sculpture 2016 Goodwood Festival of Speed. The winners will be announced at a gala awards dinner in November in London. Five years ago, Driver Group announced a new approach to the delivery of construction Expert Witness support services and Diales was born. A service that would bring together world-class experts in the fields of delay, quantum, and technical and provide support through a dedicated team, when clients needed it most. 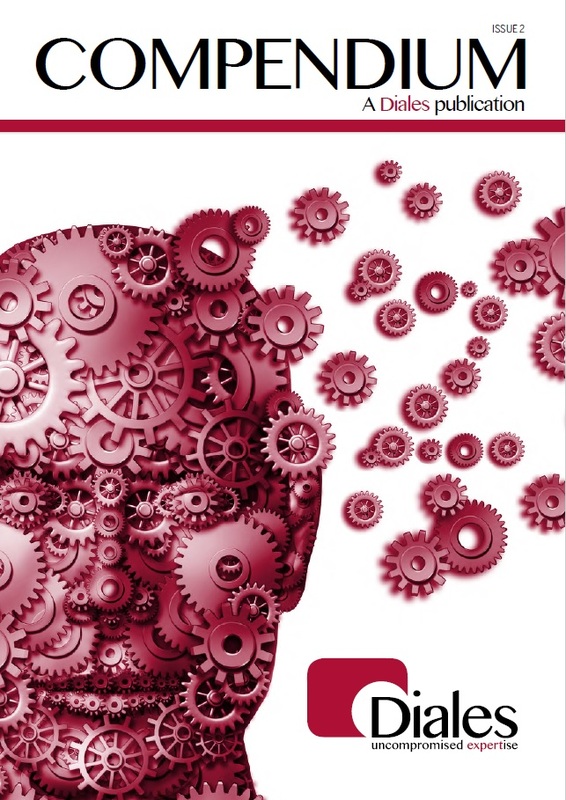 Diales launched with twelve highly-regarded and highly-skilled experts, with published authors[i] John Mullen and Peter R Davidson amongst them. The team grew as launches followed in Asia and the Middle East and more experts joined them across Driver’s worldwide network of offices from Australia to Canada. Today, the number of Diales experts is closer to 40. The technical team, headed by Stuart Macdougald-Denton, has a dedicated team of researchers, engineers, and architects; many of whom regularly share their wisdom and experiences in the pages of the Driver Trett Digest as well as through social media posts and presentations (a couple can even help make cars fly![ii]). For a five-year-old, Diales has thrived and developed well, adding further new services and skills and supporting a diverse and fascinating range of clients and disputes around the world. Paris hosted its first Arbitration Week between 24 April 2017 and 28 April 2017. The week commenced with the ICC 1st European International Arbitration Conference; this was similar to the events that Diales already sponsor in the Middle East, Far East and the US. 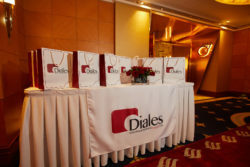 Diales were Platinum sponsors of the event, which was attended by 260 delegates from around the world. The evening saw the opening cocktail party for the Arbitration Week, attended by over 670 delegates. Those that attended early enough were treated to an opening address given by Mark Castell, Regional Head of Diales – Europe, alongside others from the world of arbitration in Paris.